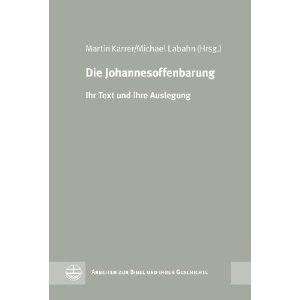 A new book of interest has been published: Die Johannesoffenbarung: Ihr Text und ihre Auslegung (eds. Michael Labahn and Martin Karrer; Leipzig: Evangelische Verlagsanstalt, 2012) and the first section has a number of text-critical articles under the heading "Text/Textgeschichte:"
Markus Lemke, "Beobachtungen zu den Handschriften der Apokalypse des Johannes"
Martin Heide, "Die syrische Johannes-Apokalypse. Zum gegenwaertigen Stand der Forschung." Juan Hernandez Jr., "Recensional Activity and the Transmission of the Septuagint in John's Apocalypse. Codex Sinaiticus and Other Witnesses"
Michael Labahn, "Die Schriftrezeption in den grossen Kodizes der Johannesoffenbarung." Daniele Tripaldi, "'Discrepat evangelista et Septuaginta nostraque translatio' (Hieronymus, Briefe 57,7,5). Bemerkungen zur Textvorlage des Sacharja-Zitats in Offb 1,7"
The last section of the book (IV) is titled Die Johannesoffenbarung in den grossen Bibelkodizes and includes German translations of the text of Revelation in the individual codices Sinaiticus, Alexandrinus and Ephraemi, as well as an introduction to them by Martin Karrer. In recent research, the Book of Revelation, the history of its text and interpretation have attracted increased attention. The anthology pays tribute to this development by publishing the proceedings of a recent conference at the »Kirchliche Hochschule Wuppertal/Bethel«, supplemented by a number of additional seminal articles. Focusing on philological and exegetical issues and employing a variety of methodological approaches, the book covers the main fields of current research: textual transmission and scriptural reception, problems of the history of religion, imagery, aspects of hermeneutics, exegesis, impact, and literary structure as well as the latter’s linguistic and religious conception, and finally the reciprocal relations of text and reader seen from a psychoanalytical perspective. The contributions show that continuous revisal of previous exegetic suppositions is a necessary and useful means to deepen our understanding of the Book of Revelation. The book can be ordered from Eisenbrauns here. Has anyone read any of it? What do they say in a nutshell? Perhaps co-blogger Martin Heide or any other reader of this blog who has contributed to the book. Speaking of Eisenbrauns, it's only 10 days until their next Annual April Sale. I'm hoping to pick up something on Goliath's height, maybe proving that the original reading only put him at 3½ cubits tall. That would be 3½ of Goliath's cubits, though. The book has four large parts. Part i: Textgeschichte (Textual History ), part ii Auslegung (Exegesis),part iii Wirkungsgeschichte & Hermeneutik (hermeneutic), part iv Die Johannesoffenbarung in den großen Bibelcodices (the revelation of John in the large codices). ... and part iv are of particular interest: After the intro by Martin Karrer, three articles (all in German) deal with the large codices: (1) the revelation of John according to codex S, (2) the revelation of John according to codex A, (3) the same acc. to Codex C.
So, after all, a book full of information and worth to have on your shelf. Thanks Martin for the summary! Thanks for the summary, Juan. If I understand you correctly, there is little extant evidence of allusions being revised towards the Old Greek, so the initial text of the Apocalypse for these allusions is fairly well established and sometimes serves as a reliable guide to the early Greek tradition(s) that underlies the second century revisions of the LXX. 1) You said that your study was not comprehensive. How extensive is your study? 2) Did you notice any patterns, such as when the Apocalypse cites the Old Greek vs. another text? Are certain books, for instance, consistently cited from similar textual traditions? Thanks for your question, Drew. The study targeted only those passages that supplied “undisputed” allusions to the LXX, as indicated by the italics in Nestle-Aland: Rev 1:7; 2:27; 4:8; 6:16; 7:16, 17; 11:11; 14:5; 15:3-4; 19:15; 20:9; 21:4; 21:7. Among these I found little evidence of recensional activity in the direction of the LXX, its multiple Greek versions, or the MT. The transmission of these allusions appears to be fairly stable; and, where there are changes, these appear to be the byproduct of factors other than recensional activity. I did, however, find that the allusions to Isa 25:8 in Rev 7:17 and 21:4 were Hexaplaric (Aquila), as well as the allusion to Jer 10:7 in Rev 15:3-4 (Theodotion). None of these are identified as such in Nestle-Aland. A quick correction: I meant Symmachus for my remarks on the allusions to Isa 25:8! My article "Beobachtungen zu den Handschriften der Apokalypse des Johannes" is about considerations that arose during the preparation of a "Text und Textwert" study on the Greek Apocalypse manuscripts. The first part answers the question, which manuscripts contain the Revelation (or parts of it) and can be examined. The second part proposes criteria how test passages may be selected to group MSS, taking into account the special characteristics of the transmission of the Apocalypse (splitted majority text etc. ); it also includes a comparison between Hoskier's and J. Schmid's grouping. The third part contains notes concerning the necessary collations. The fourth part discusses appropriate methods of evaluation for the purpose of determining the related groups and "Textwert" of each MS.
An appendix provides a table of all Apocalypse MSS (old and new Gregory-Aland number, Hoskier number, recent dating and location).